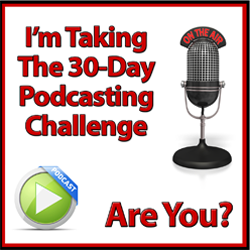 I'm taking the 30 Day Podcast Challenge - are You? Podcasting Success Secrets is a community that will feed your thirst for knowledge on how to truly create the best podcasting series to support your business. To support you in your endeavours to create a podcast series for 2015 I'm delighted to offer you a FREE ACCESS PASS to the 30 Day Challenge. It's going to be an exciting journey and I just know you are going to love being a part of this very special community. Simply click the link and join me in the challenge.